The Start: I’ve been here before. The Tahoe Rim Trail (TRT) Endurance Runs are in my backyard and I have run both the 55k and 50-mile distances in the past. This would be my first 100-mile race. There were lots of poor-quality pre-dawn photos to snap, and then we were off. Mile 17 – Out of Red House: Oddly, I started to feel better on the steep climb out of the Red House Loop. It seemed a little cooler. My friend Julie (running the 55k) spotted me with her camera, and I was feeling good enough for some goofy poses. Mile 18 – Weigh-In: I came into the Tunnel Creek Aid Station for my first weigh-in of the day – 3 pounds lower than my pre-race weight. It was my wake-up call. I have to troubleshoot my situation. Ice more. Drink more. I got on it. I was fortunate to have my own crew up at Tunnel Creek. My friend Tom hiked the 3.5 miles up the hill to help me for less than 5 minutes at a time on my first three passes through the Tunnel Creek Aid Station. He had my Tailwind sports drink mixed and ready to swap with empties. He executed flawlessly as I barked orders for ice and other necessities. Later he said that I was bossy. Really? That’s well-documented. I can’t believe he didn’t already know that about me. Mile 30 – Best Day of My Life: The rest of my A-Team was waiting at Diamond Peak. I felt fabulous and was right on schedule. My husband Javier and good friend Betsy were both there to help me through. This time the weigh-in was spot on. I got more ice, ate some turkey sliders (turkey & avocado) and got doused with hose water on my way out. My friend Pete gave me some of his famous rice balls to-go and caught me up on other friends running as he walked a little ways with me up the Diamond Peak ski slope. Mile 42 – Easy Does It: I left the high-point of the course, Snow Valley Peak, well ahead of schedule. I tried to ease up, but I could see that I would be into the 50-mile aid station about 30 minutes early. Thunder clouds formed in the distance, and it was not a question of if, but when and where, the storm would hit. Mile 50 – Hail: My early arrival caught the team by surprise, but they jumped into action. I had hoped to spend as long as 15 minutes here to prepare for the night of running. As I started to change my shoes, it started to rain. And then hail. And then flash lightening. I put my coat on (I had been carrying it all day) and my team covered me with towels and plastic. I was already getting cold. Betsy would be running with me for the next 30 miles. 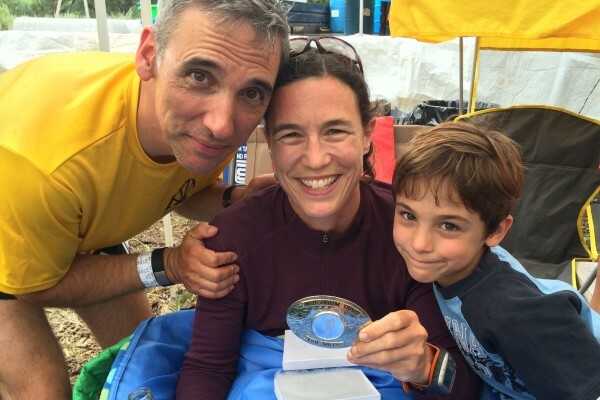 She has almost 3 dozen 100-mile finishes under her belt, so she knows what it takes. Sitting still makes you cold and wastes time. We saw a flash of lightening and heard the thunder just a second later. Time to leave. I missed seeing our kids who had arrived from Truckee just as the storm started. Javier intercepted them in the car and told them to turn around. He was soaked to the bone himself. With Javier – half-way through changing shoes as the storm hit. Photo by Julie Nye. Taking off with Betsy in the rain. Photo by Julie Nye. 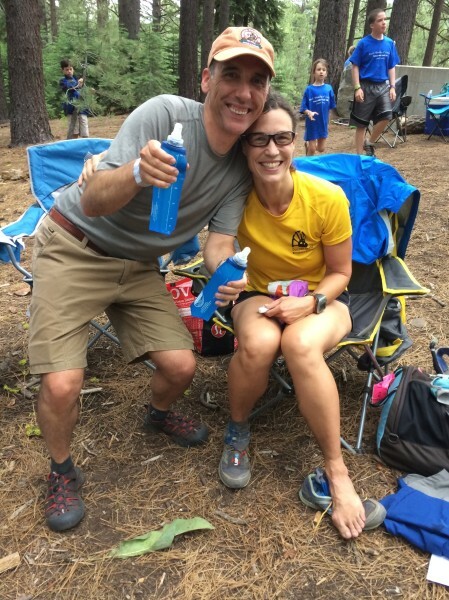 Mile 80 – Not Enough Air: Javier met us at Diamond Peak Lodge at Mile 80, where he would take over pacing duties. It felt like a slow aid station stop. I had to go outside to find the toilets, but was pleased with the first flushing toilets in so many hours. I felt fine as we initially headed up the ski slope once again, but that didn’t last long. Diamond Peak is the steepest and longest climb on the course. I have climbed it over a dozen times in training, and one training day climbed it 3 times back-to-back. I don’t do it quickly, but I don’t stop on the climb and it generally is not a problem for me. Except for this time. I simply couldn’t get enough air. Is this just how it goes at mile 80? My chest was tight under the sternum strap of my pack. Did I over-tighten it this time? I took the tiniest, easiest steps possible, but I still had to stop and gasp for air on several occasions. It took me almost twice as long as normal to make it to the top of the 2-mile climb. I was annoyed, but not freaking out. Mile 85 – Temporary Relief: I mostly hiked the remaining 3 miles back to the Tunnel Creek Aid Station, where I knew at least 3 volunteer physicians were waiting to help out. They administered oral albuterol and I felt better almost immediately. I was able to run the next 5 miles to the Hobart Aid Station. I felt the air slip away from me again just out of Hobart. The next section is a climb to Snow Valley Peak up at 9000′ feet. I did alright with moderate hiking. Mile 90 – This is Going to Take Forever: By the time we were to descend the final 10 miles to the finish, however, I just couldn’t catch my breath. Not even for a light downhill effort. I tried frequently to at least jog downhill, but would be gasping for air after just a few seconds. Here I hit the low point. I did the math. This downhill to the finish, instead of taking one-and-half to two hours, it was going to take FOUR HOURS. Really? We are going to be out here for FOUR. MORE. HOURS.? I almost cried a few times, but then reminded myself that I chose this and that many are not so lucky to have this choice. All this time, Javier dutifully followed me at my meager hiking pace. Spending the whole night and well into the morning on his feet, after spending all day crewing me. I felt bad for him. We were doing a “death march” and I know that they are particularly painful on the pacer. I couldn’t talk with him. I couldn’t even listen. Mile 95 – Seeing Things. Cool: I knew they were coming and totally expected it, but that didn’t stop the hallucinations. I actually found this to be a bonus and it entertained me for a while. That looks like a circus clown’s suitcase at the side of the trail. I wonder what it really is? A stump. And not even a very interesting one at that. It went on like that for a while. Mile 96 or so – Running Again! At last, I had descended and recovered enough that one of my attempts to “run” was successful. I could breath again! And I was able to run the final downhill miles to the finish! Mile 101.5 – The Finish: Somewhere along the death march I had instructed Javier (bossy, indeed!) to update everyone via text message to expect us around 10:15am. We found our kids and friend Rachael waiting for us just before the final single track into the finish. Rachael ran ahead to take photos and my sweet family ran me into the finish 29 hours and 10 minutes after I had started the day before. With my boys & my buckle at the finish. Photo by Julie Nye. Reflections: I loved (almost) every minute of my first 100-mile experience. Though I was frustrated hiking so much of the final downhill, I was never really mad that my goal time of 28 hours slipped away. I did what I could. And I did have some good luck with moving away from that storm, so I was actually able to claim a spot as the 10th woman finisher. The Tahoe Rim Trail (TRT) Endurance Runs will always have a special place in my heart as my first ultra (the 55k a few years ago) and now my first 100-miler. It’s in my backyard and it’s an incredibly beautiful place to train and race. The run is well-organized, the volunteers are fabulous, and it all just keeps getting better. Huge thanks to all who have supported me in this endeavor! I was especially lucky to have the A-Team including Javier, Betsy, Tom and Rachael. 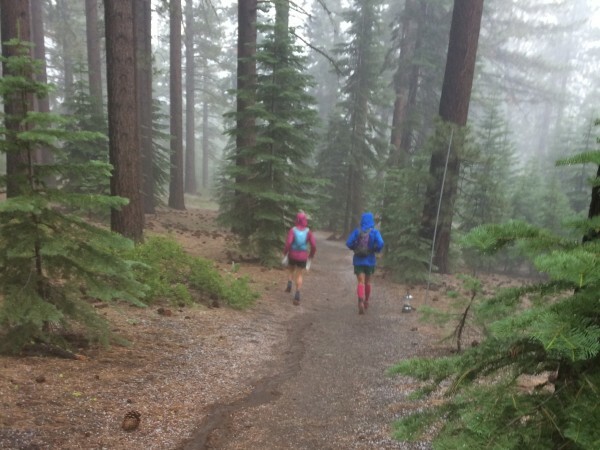 The encouragement and training support of my fellow Donner Party Mountain Runners made the ride much more enjoyable. I also want to thank my friends “down the hill,” the Wrong Distance Runners of Sacramento, who helped me get into shape earlier in the season. And, finally, to my parents and my family, cheering and sending love from afar, I knew you were with me! Afterward: I slept surprisingly well the first night. I am still quite tired four days later, but my body is no more sore than after my first road marathon. Good thing, because a couple of weeks ago I already signed up for my next 100-miler, Pine to Palm! Abundance. Nice work Helen! Way to get it done, and great report. Your respiratory distress sounds exactly like my final 30 miles at States last month. I wish I’d had the offer of an inhaler before the finish line. Have a great time at P2P! congratulations, Helen, super impressive. loved the report. I’m looking forward to following you at Pine to Palm! Thanks for reading, Jenelle! Happy Trails!